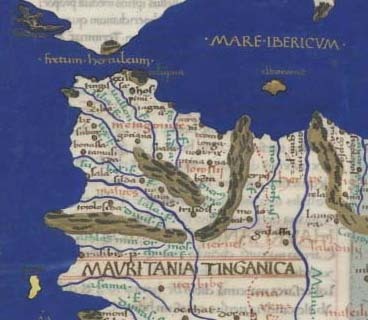 The Carthaginian navigator Hanno visited Mogador Islands in the 5th century BC and established the trading post of Arambys. 105 BC MaBocchus first extends the kingdom of the Moors to the east. Juba II established a Tyrian purple factory, processing the murex and purpura shells found in the intertidal rocks in Essaouira and the Mogador Island. This dye colored the purple stripe in Imperial Roman Senatorial togas. A Roman villa was also excavated on Mogador island. Assassinat de Ptolémée, dernier roi maure. 533 AD The Byzantines try to retake the Maghreb. 622 AD The Hijrah refers to the Prophet's migration from Mecca to Madinah. This journey took place 622 AD This is the beginning of the Muslim calendar. 681 AD Uqba ibn Nafii arrives in Morocco. 700 Arab invasion. Idrisids founds the first major Muslim dynasty. 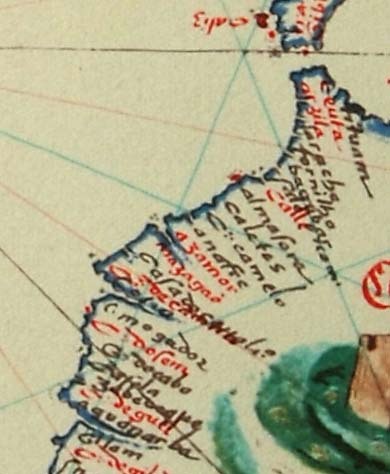 711 Tariq Ibn Ziad débarque en Espagne. 1578 -1603 The sugarcane factory constructed by the Sultan Ahmed El Mansour Essaâdiwas in use 25 years. Ida Ou Gourd. 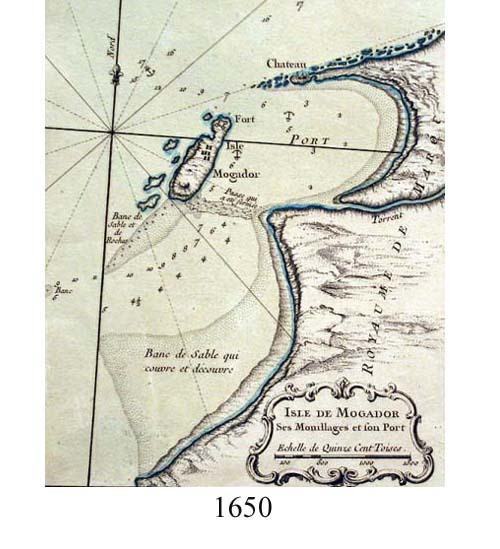 1626 The French Cardinal Richelieu sent his envoyé Chevalier Isaac de Rasilly (1587 - 1635) to occupy the Island of Mogador. 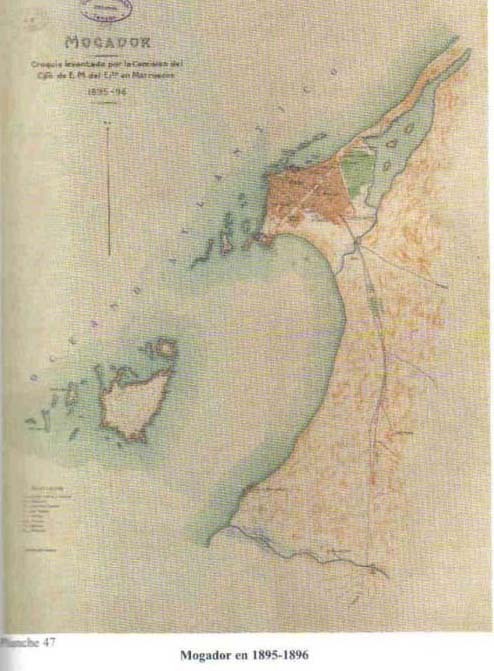 and the passage from the island to the mouth of Oued Ksob. 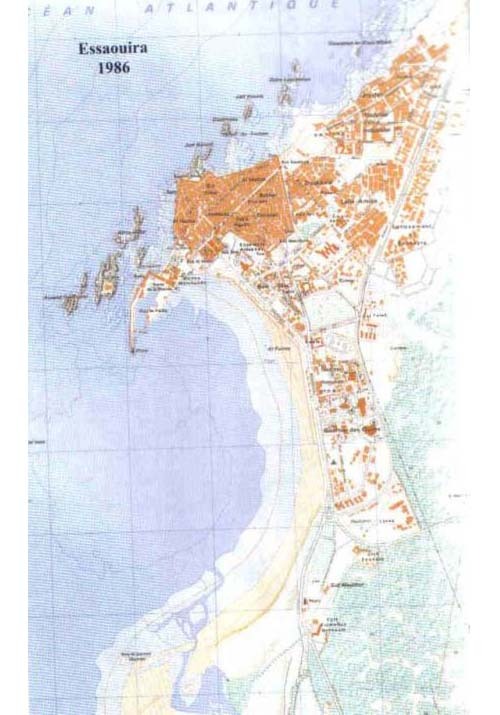 1755 The earthquake 1st of November 1755, Lisbon ( Magnitude 9) and the following Tsunami with 15 m high wawes who destroyed parts of the towns at the Moroccan Atlantic coast including Mogador. Scala the Kasbah was built and The Danish Consulate was the first European consulate in Mogador. 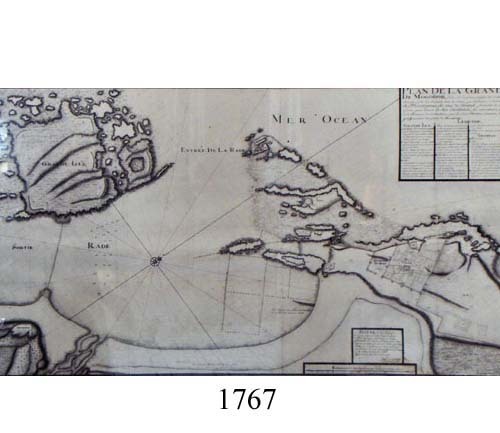 Built in 1765. 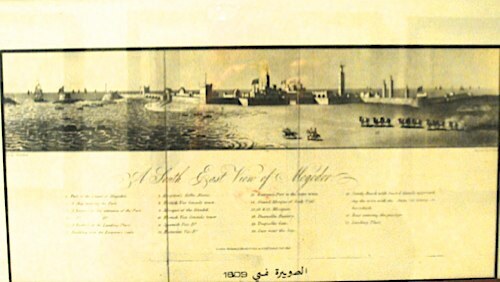 1770 Inscription Scala the Port "Bab el Mersa"
and the Zaouia Kadiria and the Mausoleum of Sidi Magdoul. He also intalled the new quarters for the Jews - Mellah Jdid. 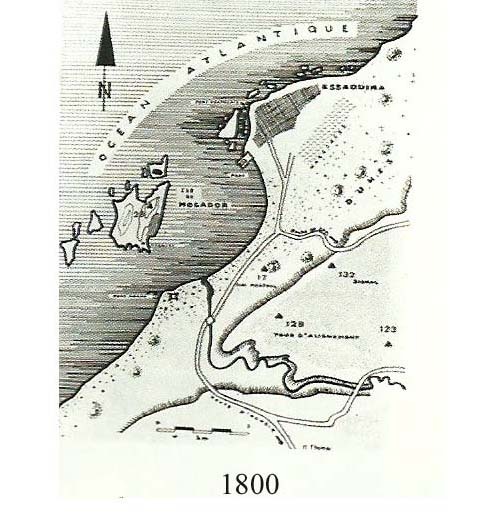 occupied by the French Navy under the Prince de Joinville on August 16, 1844. 1912 Morocco becomes a French protectorate under the Treaty of Fez, administered by a French Resident-General. 1912 Maréchal Lyauthey ordered 1912 to build the clocktower (Magana) in the new Kasbah. 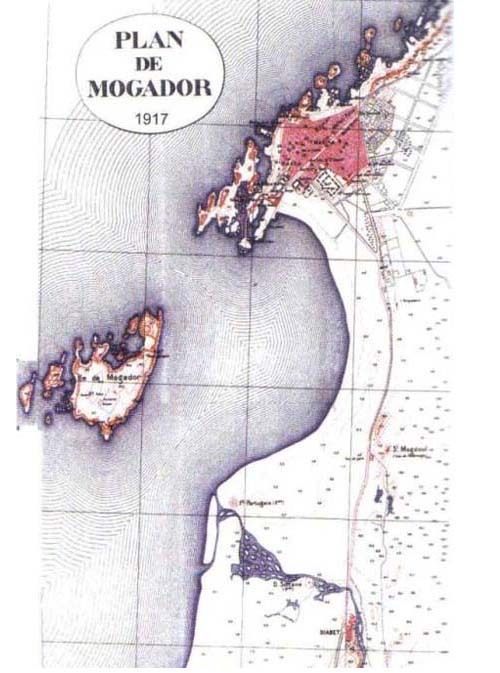 1913 - 1948 Dr Charles Louis Gustave Bouveret came from Paris to Mogador in June 1913. He stayed and worked as a doctor until he died 1948. 1936 The catholic church Sainte-Anne was inaugurated by Henri Vielle 1936. 1949 1949-1951 Orson Welles worked on Othello and filmed in Essaouira. 1950 1950 was the port of Essaouira the most important for Sardines in Morocco but also for export of cereals. 1956 March - End of French protectorate after unrest and strong nationalist sentiment. Sultan Mohammed becomes king in 1957. 1960 Agadir earthquake took place on February 29, 1960, at 23:40 local time. 1961 Death of King Mohammed. King Hassan II comes to power. 1969 Jimi Hendrix (1942-1970) visited Essaouira in the summer of 1969. 1975 6 November - The Green March. King Hassan orders 350,000 civilian volunteers to cross into Spanish Sahara. 1999 King Hassan II is succeeded by his son, Mohammed VI.